Dr. Elliott Moscot, founder and CEO of Optometric Options, is a third-generation optometrist whose grandfather Hyman started one of the first optical establishments in the United States nearly one century ago (see Moscot.com for a full family-history). After Dr. Moscot graduated from the Massachusetts College of Optometry in 1976, he was staff optometrist at Hadassah Hospital in Jerusalem, Israel. From there he volunteered to work in Torfeh Hospital in Tehran, Iran and was there until the beginning of the Iranian Revolution in 1979 (for which he wishes to take no credit). After 1979, Dr. Moscot subsequently moved back to his hometown, New York City, NY and practiced in Manhattan until 1988, whereupon he moved with his wife Kathy to Los Angeles. In 1989 he opened the first Optometric Options Office which quickly grew to four mall locations in the Los Angeles area. In 1991, Dr. Moscot was a co-founder of Optic Plus which is now one of the largest optical distributors and retailers in the Russian Republic and surrounding states. Travelling throughout the former Soviet Union, Dr. Moscot lectured and trained many Russian eye doctors of the region in the fitting of contact lenses as well as other ophthalmic products and procedures that were then becoming available in all parts of the world. 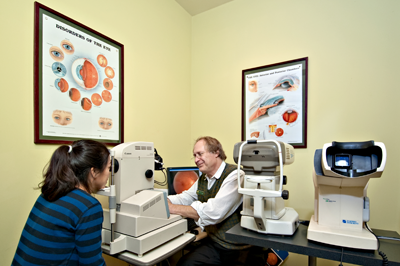 In 2006, Dr. Moscot consolidated the mall locations of Optometric Options to its new larger facilities that is currently located in West Los Angeles. Dr. Moscot has been married to Kathy Reif for 22 years and has three teenage sons. Among his other accomplishments he is especially proud to have climbed some of the highest peaks in the Himalayas, Andes, and Alps.